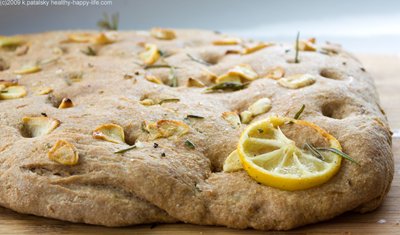 Here is my recipe for Whole Wheat Summertime focaccia. 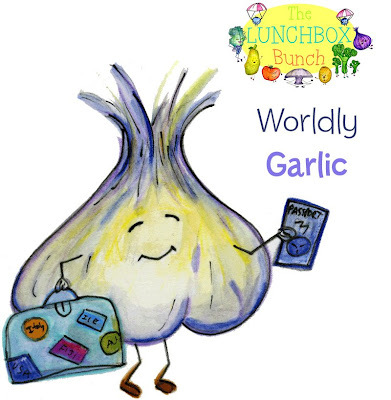 The flavors are inspired by pure summertime: Sweet roasted garlic, sprigs of rosemary and a hint of sunny lemon. All kissed with a nice grassy Italian olive oil. If you're like me, the smell of freshly baked focaccia bread makes you feel warm and cozy. And even better is when that smell is wafting from your own kitchen counter. It is incredibly simple to have freshly baked bread in just under two hours. And most of that time you can kick up your heels or take a 'bread-baking-nap, while the dough rises. And no, you don't need one of those fancy bread machines that takes up an entire section of your counter. Focaccia bread is a favorite of mine. Soft spongy texture, olive-oil kissed crevices and those hand-poked-holes that create a quilt of warm crust. But most focaccia bread is made with white flour. That's fine. But I like to bake whole wheat focaccia. It turns out surprisingly light and it has a nice heartiness to it. Eat it plain or use it as the perfect flavorful sandwich bread. Got a few hours? Try this recipe and re-discover your inner-bread-baking self. garnish: oil, garlic, rosemary and thin lemon slice. Stir in olive oil, 2 Tbsp chopped rosemary, 1 Tbsp lemon juice, 1 tsp salt and flour. Add more flour if dough is too sticky. Turn the dough on a floured surface. Knead the dough for a few minutes, in a folding motion until dough is smooth and 'happy'. Grease the large bowl with olive oil and plop dough into it. Roll around a few times to coat dough in a gloss of oil. Cover bowl with a warm damp cloth or clean dish towel. Paper towels may sink into dough, so are not recommended. Place bowl in a warm spot. Perhaps the top of your fridge or high cabinet. Punch out the dough!One big punch to the dough will do. Place it on your floured surface and knead gently a few more times. With a rolling pin, roll out dough to about 1 inch thick. You may modify this based on how thick you can your bread. 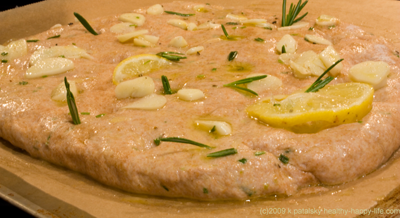 Place dough on a baking sheet. Lightly oil it or use parchment paper. Poke rows of holes in the dough with your finger. Brush top of dough with a mixture of your remaining ingredients: olive oil, lemon juice, chopped and whole rosemary and chopped garlic. Add a few very thin lemon slices to edges for a sunny presentation. Sprinkle some course sea salt on top as well. Cover with the towel and let rise again for 20 minutes, in a warm spot. Place your dough in a 350 degree pre-heated oven. Let bake for about 30-35 minutes, or until a light brown crust forms. Check bread for firmness with a toothpick. Let the bread cool for a few minutes before slicing. Store in freezer or eat in a few days.